There are more galaxies in the visible universe than there are stars in our own galaxy. While, you can only see about 1000 stars on a clear, moonless night from an open spot, there are about 9000 stars that your eye is incapable of perceiving. But drag out a telescope and the number skyrockets. Use the Hubble and a really long exposure, and you can see even more. But get this: virtually every star you've ever seen, even in pictures, is in our galaxy. Stars in other galaxies are just too small to be resolved individually. And there are no stars floating around between galaxies. The Milky Way is home to 200-400 million stars; and as galaxies go, it's a pretty big one at something over 100,000 light years across. We live in an outlying, decidedly middle class neighborhood, about 25,000 light years from the center. There's absolutely nothing special about our little corner of the Universe, except that we know that—intelligence is a peculiarity that, so far at least, appears to be unique in the Universe. The observable universe, by comparison, contains at least 80 billion galaxies. 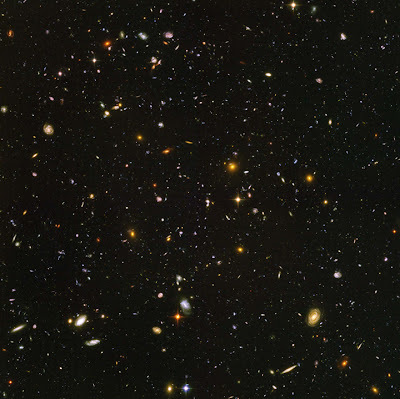 The Hubble Deep Field image above shows about 3000(and no stars), but the field covers an area of sky only about 0.04 degrees on a side (the same as a dime 75 feet away). It would take 27,000,000 such patches to cover the whole sky. Ignoring such factors as absorption by dust in our own Galaxy, which make it harder to see outside in some directions, the Hubble telescope is capable of detecting about 80 billion galaxies. In fact, there must be many more than that since the most common kind of galaxy in our own neighborhood is the faint dwarfs which are difficult enough to see nearby, much less at cosmological distances. Then there's all the rest of the universe we can't (and never will) see because the nether reaches are expanding faster than the speed of light. And if you really want to be rigorous we probably should consider the number of galaxies in other universes that are part of the so-called megaverse. "Twinkle, twinkle little star," takes on a whole new meaning, doesn't it! i find this really fascinating, and i have had this question on my mind for years.i would definitely recommend this site to anyone looking for the seemingly unexplained questions. i think someone already has an answer but doesn't know it yet. in this case i'm hoping i'm right and we find one of the biggest questions of the universe.